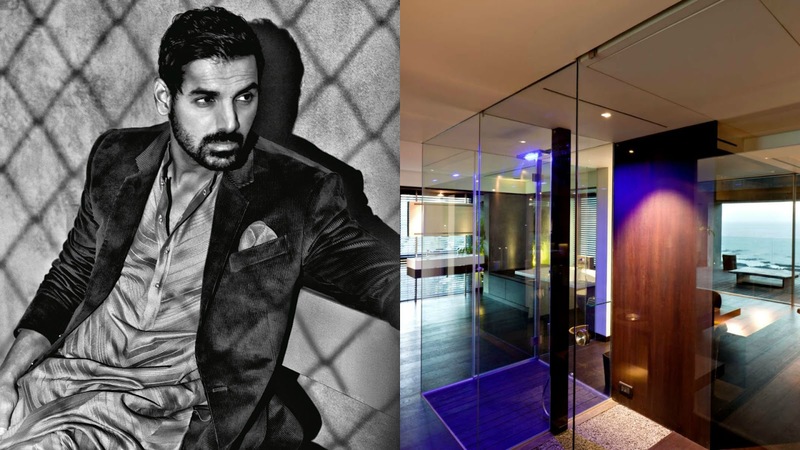 While some of us may balk at the idea of working on an extensive project, such as a home renovation, with our siblings, Bollywood actor John Abraham embraced the idea with this luxurious apartment project. His brother Alan, an architect with Abraham John Architects, undertook the logistically challenging but ultimately stunning project of combining two older apartments in the city into one modern, spacious two level apartment and terrace. The results are not only a complete change from the original look, but are sustainable, chic, and perfectly suited to this actor's life. The space is located on the 7th and 8th floors of a building described as “unremarkable.” To combine the two apartment spaces, all internal walls were taken down and a new staircase, cantilevered off the interior columns, was added to connect the floors. It should be no surprise that the spectacular views of the Arabian Sea were among the most attractive features of this space and as such, were maximized with the new design. This included putting in floor to ceiling windows wherever possible, including the massive new master bedroom. In fact, these sea views are now visible from every room of the house. The kitchen is in the southeast corner of the home, which not only makes it adhere to the ancient traditional Indian design principles of Vastu, but also means plenty of morning light for a truly rejuvenating breakfast. Speaking of which, the kitchen island, which could easily double as a breakfast bar, is made from a stark stainless steel for an ultra modern look. Along with the living room and dining area, the kitchen creates the central meeting area of the home, which is perfectly laid out for dinner parties and entertaining. We must draw attention to the hand hewn dining table and seating, both of which are made from teak. The master bedroom, complete with its amazing views, also contains a luxurious bathroom and private whirlpool as well as entrance to the stunning deck area with infinity pool and outdoor entertaining space. On the top floor of the home, the architect has added a private media room which includes blinds for turning it from a glass enclosed overlook to a cozy cave for screenings. The materials in the home are kept largely natural as well as neutral. This gives the open space a unified feeling throughout while also making maintenance much easier. Further, sustainability was a concern, so local woods and green construction practices were used wherever possible.